Accessibility: A flight of 7 exterior steps to get to gallery. There are handrails on either side of stairs. Volunteers will be on hand to provide assistance. Join us at our pop-up gallery located at the new VIctoria Arts Council space at the corner of Store and Herald. The festivities begin with our opening reception on Friday August 24th and continue all weekend with various workshops and activities. See and experience the art of artists and performers who call Victoria home. Visit our Artists Page for more information on who will be featured in the HQ Gallery. Accessibility: Ground level , wheelchair accessible. arc.hive artist run centre opened in January 2017 with a focus on facilitating the emergence and development of collaborative practices in contemporary arts, including visual, performative, writing, video and sound. The centre currently provides studio spaces for seven artists and one composer, as well as maintaining a small gallery for exhibitions and performances in support of emerging arts practice in the community and beyond. In conjunction with Integrate Arts, arc.hive will host open studios and a studio members' exhibition "Swell", focusing on art practice as a crescendo, surge or spilling over of creative communities through arc.hive, the festival and the community at large. Accessibility: The Art Gallery of Greater Victoria is wheelchair accessible with a ramp to the main entrance and into the gallery spaces. The upper-level administration offices are not wheelchair accessible and are accessed by three flights of stairs. There are four gender inclusive washrooms that are wheelchair accessible. 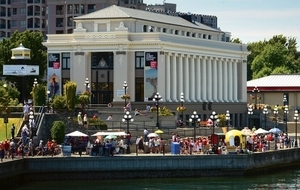 The Art Gallery of Greater Victoria is a non-profit public art gallery located on the traditional territory of the Lekwungen peoples. The city's go-to for great art, great people and thought-provoking conversations. The Gallery features contemporary and historical art by local, national and international artists, with the largest public collection in the province. We provide a range of dynamic public programs for all ages with the intention to inspire, provoke and challenge our visitors. Free admission to the gallery from 10-5 on Saturday Aug 25th. Artists from our Art Rental and Sales program will be on site providing demos and there will be an exhibition exploration at 2:00pm of Supernatural: Art, Technology and the Forest. Accessibility: window gallery, street level access, wheelchair accessible. Pop-up show and window project, titled ALMS, showcasing a series of contemporary abstract paintings by the artist Michael Jess. This work is presented in several windows of a vacant commercial space and can be viewed anytime. This temporary space called Gallery H will accommodate new work every 3 months until it is developed. Accessibility: Two steps at the front door. Fine furniture and Artisan woodcraft gallery displaying custom furniture and kitchenware items. Cute dog. Accessibility: street level access, wheelchair accessible. CineVic is an artist-run society which provides independent filmmakers and media artists with affordable and accessible development opportunities, programming, and equipment resources. Come check out the headquarters of CineVic: Society of Independent Filmmakers! Our film, video, and equipment library will be on display, and you can find out more about our upcoming Fall programming (including our upcoming Shock Therapy: Short Canadian Horror Films event in October!). Festivals Hours: All hours; Launch on SAT. 2PM—12AM. Concrete Canvas is an outdoor gallery for street art and creative expression, and will contribute to the City’s cultural legacy for years to come. Local, national, and international artists will paint in the Rock Bay Neighbourhood August 12-27. Come check it out! A community celebration to honour the mural creation by local, national, and International artists. This is a family friendly event with afternoon walking tours, a panel discussion, and an evening of local bands and beers! Accessibility: Errant ArtSpace is accessible with free parking adjacent to the building. Errant artSpace is a full time venue for working artists, located a 5 minute drive from downtown Victoria. Member artists work out of seven individual private work spaces. Exhibitions include works from member artists. We have significant newly renovated space to exhibit contemporary art work including sculpture, painting, mixed media, drawing, installation and printmaking. A diverse range of artistic practices which include abstract painting, anthropological sculpture, conceptual photography and our world famous performance art puppetry experience. Junior creatives can enjoy games, bubbles and wall drawing. Door prizes!! Festival Hours: Hours per fifty fifty website. Accessibility: Ground level, wheelchair access, no access to bathrooms, street parking. 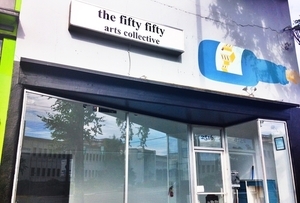 the fifty fifty arts collective, located in unceded and occupied Lekwungen Territories (Victoria, BC), is a not for profit, volunteer-run, multi-disciplinary programming space that supports both emerging and established artists. We are committed to the underground, the underdog, the experimental and the emergent; to curatorial proposals, workshops and skill-sharing; and to group exhibitions, collaborations and artist talks. We seek to make our exhibition space viable to artists outside of Vancouver Island and the Lower Mainland, in order to exhibit work from across Canada and share it with our communities, thereby deepening both our critical and inspirational engagement with the arts. Drawing on both historical perspectives and personal stories, Blue Crush considers the ways that we inherit, inhabit, and embody our differing lived experiences, and how these experiences inform our relationship to swimming. By positioning sites such as pools and beaches as both places of recreation, and as colonized and contested spaces, swimming and beach culture are explored through the intimacy of personal narratives within the larger context of social and political realties. From the history of the breast stroke to All Bodies Swim's, from civil rights wade-in's to coming-of-age experiences in Christianwaterparks, Blue Crush is an intersectional portrait of swim culture. We want to acknowledge that this work is happening on Lekwungen, W̱SÁNEC, T’Souke and Scia’new Territories - and that histories of settlement, colonization and resistance, inform our movements and navigations of swimming on this land. Accessibility: Upper level accessible by entering at Johnson St main gate. Lower level accessible by entering through parking lot on Pandora Ave.
One of the city’s oldest landmarks, Market Square is centrally located in downtown Victoria. Just one block south of Chinatown and an easy 5-10 minute walk from the Inner Harbour. A “must see” for visitors on vacation; a regular stop for locals enjoying some of the best shopping and dining in the city! MediaNet provides video production and post-production facilities to enable artists to create independent, artistic works in video/film. We advance education in the media arts by offering workshops on topics related to film and video, as well as intensive production programs. The purpose of MediaNet and FLUX gallery is to support the creative use of the medium of video/film as a form of communication and personal expression. FLUX presents innovative media art works by local, national and international media artists. For INTEGRATE we will present multi-screen media art projections. Wall projections will be taking place 5pm - 10pm on Saturday, August 25, with works playing on monitors during the afternoon art crawl. Accessibility: Full accessibility, ramps, handrails, accessible and universal washroom facilities, the library is a welcoming space for all. Greater Victoria Public Library builds community and supports literacy and lifelong learning by providing free access to information, space, tools and expertise. GVPL provides services and collections in 11 libraries and online to more than 315,000 residents in 10 municipalities. The library is your place to connect, discover and imagine. GVPL is proud to host a lively afternoon of art for the whole family. Stroll through a StoryWalk®; learn to create mini masterpieces with local artists, be serenaded by performers from Pacific Opera Victoria, and enjoy spoken word with Victoria’s Youth Poet Laureate Agartu Ali. Drop-in. During the festival weekend, there will be books, inks, rollers etc. so visitors can get a good idea of what printmaking is. There will be around 15 artists showing and selling work-prints (framed or unframed) and cards. Ground Zero Printmakers Society is a Victoria-based arts organization formed as a not-for-profit in 1989 to support the practice and dissemination of printmaking. The Ground Zero Printmakers are now celebrating their 30th year. As the only available open source printing press with expertise in Victoria, it offers workshops, residencies, and drop in studio time. Printmaking is enjoying a resurgence in the contemporary art landscape, with the generation of modern twists on a traditional technique. If you want to find out more about this exciting and diverse artistic medium, come and visit during the Integrate Festival to see artist portfolios, demos, and a show of the existing members' work. The Ground Zero Printmakers will have their studio open for touring during the weekend. An exhibition of miniature prints, a glimpse into the world of international print biennials will be shown. Artist portfolios will be on view to show the wide range of printmaking styles and members will be present to talk about the exciting potential of their medium. Ground Zero member, Randie Feil, will be doing a demonstration of the mezzotint intaglio printmaking process. She will be using a rocker to texture the plate and will be showing a simple water based printing method using the printing press. To see Randie's intricate work go to www.randiefeil.com. The demo will start at 1pm on Saturday August 25th during the open house and mini print show. At the University of Victoria Legacy Art Galleries, art works to promote dialogue around issues that matter. Our exhibitions and programs activate research and learning through university and community collaborations. 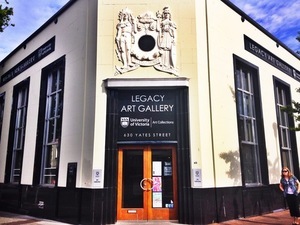 The Legacy Art Gallery Downtown is UVic’s primary art gallery space. It is a lively and engaging centre for art that is easily accessible to the community and features rotating exhibitions. On campus Legacy features over 2000 works of art from the collection on public display and has two other exhibitions venues. All free to enjoy! Open Action Collective Founders live performance in Making It Performance artists and founding members of Victoria’s Open Action Collective, John G. Boehme, Judith Price and Grace Salez will perform live at the Legacy Gallery in the exhibition Making It. 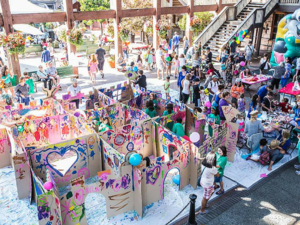 Join us during Victoria’s Integrate Arts Festival as they respond to 36 chairs designed and built by local woodworkers. Visitors are invited to drop in to the gallery as the performance unfolds over two hours during Saturday afternoon’s art crawl. Accessibility: Both entrances have one step from the sidewalk. Wheelchair access is available through the door to the right of our View St. entrance (please ask for assistance). Madrona Gallery is a contemporary and historic fine art gallery located in the heart of Victoria. The gallery exhibits work from Canadian Masters such as Emily Carr, Members of the Group of Seven, J.W. Morrice, E. J Hughes and their contemporaries; art from established and emerging Canadian artists; additionally the gallery also exhibits a world-class collection of Inuit carvings, drawings and prints. Madrona Gallery is pleased to present KIN, a group exhibition of works by contemporary Canadian female artists. The show is presented as a part of our annual Colours of Summer exhibition and in conjunction with Integrate Arts Festival 2018. Included are works by artists Tamara Bond, Samantha Dickie, Megan Dietrich, Meghan Hildebrand, Morgana Wallace, Caitlin McDonagh, Nicotye Samayualie, Ningiukulu Teevee, and Diana Thorneycroft. Across their respective media, these nine artists engage with themes of craft, narrative, gender, and sexuality, each with a critical awareness of the legacy forged by female contemporary artists before them. From Diana Thorneycroft’s photographic homage to Cindy Sherman, to Megan Dietrich’s fluid abstracts in the style of Helen Frankenthaler and Ningiukulu Teevee’s depictions of women in folklore and contemporary Inuit culture, each of these artists engages with the conversation of gender in fine art from a unique perspective. We hope you will join us for our annual Integrate Showcase, and experience the work of these artists firsthand. Accessibility: Window gallery is fully accessible at street level. Studio is accessible on the first floor. The Ministry of Casual Living (MoCL) is a registered non-profit society and a member of the Pacific Association of Artist-Run Centres established in 2002. Established to provide artists from all disciplines with an accessible venue for experimentation, MoCL is committed to promoting critical, self-reflective discourse, and integrating the artistic process into all aspects of everyday life. We operate a Gallery and Artist Studios at 858 Devonshire Road, in the Esquimalt Industrial Park as well as a window gallery in Millie’s Lane (Odeon Alley) off the 700 block of Yates Street. The third in a series of monthly open air film + music nights, ARCHIVE digs deep into Victoria's film vaults to unearth surprising experimental and animated shorts from the 80s, 90s and 00s PLUS live score and performances by local musicians and DJs. By donation, all ages. Popcorn and refreshments available (cash only). Accessibility: Open Space is not wheelchair accessible and can be accessed by a stairway of 23 steps. The stairwell is almost 5 feet wide and has two landings, as well as a wooden railing. There are two gender inclusive washrooms, one multi-stall and one single stall with a urinal. If you have any other questions or concerns, please contact openspace@openspace.ca or 250-383-8833. Founded in 1972, Open Space is an artist-run centre that presents contemporary art across a variety of disciplines, including visual art, music, writing, performance, and media arts. Working on the unceded Coast Salish territories of the Songhees and Esquimalt First Nations, Open Space seeks to engage with the work of folks from diverse cultures, generations, disciplines, and communities, while fostering vital conversations around art and community. ColorQoded Arts Collective presents a celebratory night of dancing and performance at Open Space Saturday, August 25 from 8pm-midnight. Come out to gather together with QT2IPOC artists to celebrate each other's art, company, and radiance! Accessibility: Wheel chair access is available at the west end of the building. Admission by donation on the festival weekend. Explore nature up close and personal. Located on the inner harbour, the Robert Bateman Centre has the largest collection of wildlife paintings by Robert Bateman, a famous Canadian naturalist and wildlife painter. Enjoy a 45 minute tour through the gallery with one of our Bateman experts. Learn about Robert’s evolution as an artist, and hear personal stories behind the creation of his work. Accessibility: Not wheelchair accessible. There are steps to enter the mobile theatre truck. Known for their sense of fun, Theatre SKAM was formed in 1995 with a mission to create theatre that is innovative and entertaining, and above all – never boring. SKAM’s mandate is to create a living, contemporary, professional theatre; to provide varied and provocative theatrical entertainment for audiences in Victoria and on tour; and to employ emerging theatre artists. The Pop-Up Live Theatre is a black box theatre, operating on the back of a pick-up truck. Inside, you will find 6 theatre seats, and a lighting grid. Theatre SKAM currently operates the Pop-Up at a variety of markets and parks in the City of Victoria, presenting original, short pieces by local artists, and catering to what we lovingly call "small-batch entertainment." Accessibility: Not wheelchair accessible, on the third floor with no elevator. In the heart of Chinatown discover an art studio in a historical building on the third floor. There will be paintings and etchings from three artists. Bev Thompson, Rosemary Kemp and Sarah May-Pool. "I am a printmaker who was born in Alberta, Canada. I have drawn artistic inspiration from different landscapes, and through extensive travel and time spent working abroad, have broadened my practice and choice of subjects. I am drawn to different landscapes, and have been intrigued by the delicate landscape traditions of people from other countries. For almost six years I lived in Nepal, developing my etching and printmaking practice at the studio of renowned artists Seema Sharma Shah and Uma Shankar Shah. Since my return to Canada, I have settled on Vancouver Island and have benefitted a great deal from the collaborative ethos of the Printmakers Groups on the Island. The organization has a culture of continuous learning and sharing technique and information that has been very important to me as an artist. Subsequent to a year at the Victoria College of Art, I continue to participate in workshops with artists in the Victoria area Ground Zero Printmakers www.groundzeroprint.comthat have been multi-disciplinary in nature, and these have given participants an opportunity to share and learn from each other as we bring aspects and techniques of our respective disciplines together. My career is as a teacher, and as such I have taught ESL to adults and children alike. As a Waldorf teacher I taught the entire Waldorf curriculum for seven years, and have taught art extensively to children and adults in that capacity. In a professional role I held in Duncan in 2009/10, I coordinated a program” What is Home” of artistic shows and performances in collaboration with 30 artists Newcomers and aboriginals working in a wide array of disciplines. For the past year I have taught art classes to adults in China as well as teacher training classes including painting, drawing and print making." Rosemary Kemp is an artist born in Calgary, Alberta and working in the heart of downtown Victoria, B.C. She produces primarily oil paintings but her output also includes sculpture and drawings. While she has worked with figurative and still life subject matter, portraiture and landscapes form the core of her work; her strong technical foundations and Impressionist influence are frequently evident in both. In addition to having recently completed a three-year program at the Victoria College of Art, Rosemary is a holder of a degree in psychology from the University of Victoria. Her background in psychology has contributed to her fascination with portraiture, and the portrayal of complex human emotions is central to her work. She prefers painting on larger canvases and capturing expressive subjects in portraits, both from photography and life. Her landscapes are often informed by a childhood spent close to the Rockies and typically feature grand nature scenes with an emphasis on the treatment of natural light and colour. Sarah May-Poole is an artist and teacher. Growing up in landlocked Ontario she was drawn to the coastal lines of Victoria. She graduated with a degree in Fine Arts from the University of Western Ontario, continuing on to become an art teacher and completing her Master of Education (MA). She uses paint to connect with the natural world instead of being consumed by digital identities. Working primarily with acrylic on canvas, her paintings speak of the mythical lost, childhood whimsies, brilliant sunsets settling upon hazy mountains. They move from her mind to the canvas, a sliver of wonder, ocean, dreams lost and found, kept safe. Her paintings radiate hues of vibrant colours, dripping to create vast coastal lines and towering trees. They run into veiled deltas that engulf pebbled mountains. The artwork sometimes seems as if it is just empty spaces, but upon closer inspection it is filled with life & colour. They allow observers to slow down and connect with something tangible in our fast-paced society, to get lost in each brushstroke. She allows the paint to breathe on the canvas. Sometimes they are meant to bring peace, while other times they unsettle or disturb. Sarah currently creates art at Studio 553 tucked away in Victoria’s Chinatown allowing the sounds of the busy street to keep her company. Accessibility: ground level access, but surfaces are not paved. Expect uneven surfaces. Courtyard behind 833 Fort St, sponsored by PARC Living. Gate access. See featured artist Taryn Walker’s new mural installation and drop by the AGGV pop-up shop. FRI 7-10PM Multimedia performance curated by Garden City Electronic Music Society as part of Fuse: Decay, Renewal, Reconciliation. Accessibility: Located on the second floor, no elevator, not wheelchair accessible. Xchanges is located in a complex situated between Gregg's Furniture on Government St. and Dairy Queen on Douglas Street. There are driveways to the complex on both Government and Douglas Streets; there is onsite parking. There are bus stops on Douglas Street very close to Xchanges. Xchanges is a member-driven artists-run centre operating a gallery and affordable studios for practicing artists. We house nine individual and group studios, including the photography studio of Crossgrain Photographic Society. Xchanges programming supports a range of visual arts mediums with a particular interest in exhibiting the diverse practices of artists in the early stages of their career and those who have taken a new departure with their work. Gallery programming focuses only on artists of Greater Victoria and the Gulf Islands, and is selected by a jury of community members once a year. In the gallery for Integrate is the work of BOXCARSIX Artist Collective created during their summer residency at Xchanges. Entitled "#The View From Here", it is a collaborative contemporary drawing studio installation. This summer residency has received sponsorship from Opus Art Supplies. The gallery will open noon to 4pm on Saturday and Sunday providing great opportunities to discuss the work with the artists of BOXCARSIX. On Saturday there will also be a Studio Open House from noon to 4pm allowing visitors to see in working studios and talk with different artists. Plus, the hallways will become Xchanges Art Passage - This will be an exhibition of small works for the discerning budget featuring a variety of subjects. Almost every house or office has at least one tiny space just "reaching out" for a small work of Art. Please come and take a look, this may be a fine opportunity to add a quality original to your collection. Accessibility: ground level access, but surfaces may be unpaved and uneven. The location of the second part of artist Estraven Lupino-Smith’s workshop about bat field recordings. Be sure to check out the first part at HQ at 1-3PM.